Integrating with Southeast Asia is a key component of China’s multi-pronged regionalisation around its borders as its global rise continues. Below, Xiangming Chen and Curtis Stone consider the ambition of China’s ‘Go Southwest’ strategy to extend its economic interests and influence into Southeast Asia, and explore how China’s regional assertion reinforces the larger trend of new spatial configurations in light of increasing globalisation. The authors show how simultaneous globalisation and regionalisation unleashes a dual process of de-bordering and re-bordering where the traditional barrier role of borders is yielding more to that of bridges, as small, marginal, and remote border cities and towns become larger centers of trade and tourism. This article examines China’s effort to engage Southeast Asia and many of China’s footprints within and beyond the cities of the Greater Mekong Subregion (GMS). Inter-country and intra-regional trade provides the starting point for examining the extent of economic integration in the GMS, and also its unbalanced development. In a coffee shop in central Vientiane on a hot summer day in 2012, two young Chinese businessmen from northwestern China, sipping ice-cold Latte, talked about the prospect of a new venture to explore copper in the mountains of northern Laos: ‘If we make $100 and they [Laotians] get $5, they should be happy’. On the outskirts of Yunnan’s capital city of Kunming, China’s fourth largest airport behind Beijing, Shanghai, and Guangzhou (also the world’s fifth largest airport in occupied area), Changshui International Airport, which is expected to have flown 38 million passengers by 2020 and 65 million by 2040, was opened with much fanfare in June 2012. While seemingly disparate, this pair of anecdotes reveals the ambition of China’s ‘Go Southwest’ strategy to extend its economic interests and influence into Southeast Asia. Integrating with Southeast Asia is a key component of China’s multi-pronged regionalisation around its borders as its global rise continues. China’s regional assertion reinforces a larger trend of new spatial configuration as an inherent part of increasing globalisation driven by China. This simultaneous globalisation and regionalisation unleashes a dual process of de-bordering and re-bordering where the traditional barrier role of borders is yielding more to that of bridges (Chen). As a result, once small, marginal, and remote border cities and towns have become larger and lively centers of trade, tourism, and other flows. China’s effort to engage Southeast Asia leaves many striking footprints within and beyond the cities of the Asian Development Bank (ADB) facilitated Greater Mekong Subregion (GMS), which was launched in 1992 and consists of China’s Yunnan Province (with the later addition of Guangxi Zhuang Auto-nomous Region), Cambodia, Laos, Myanmar, Thailand, and Vietnam. Inter-country and intra-regional trade provides the starting point for examining the extent of economic integration in the GMS as well as its unbalanced development. 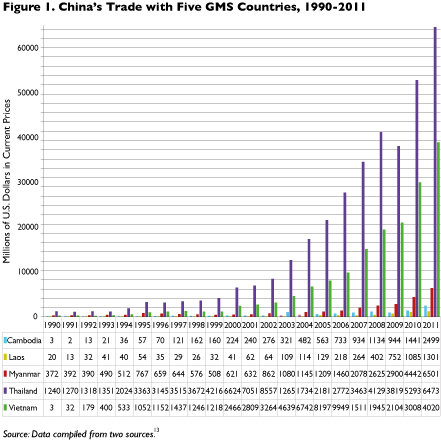 China’s trade with each of the GMS countries has grown since 1990, most rapidly since 2000 (see Figure 1). Given the size of their economies, Thailand, followed by Vietnam, led the smaller GMS countries in trade with China. However, the total volume of China-Myanmar trade rose by $5.9 billion from 2001 to 2011, while China-Laos trade increased by $1.2 billion (Figure 1). Much of China’s growing trade with Myanmar and Laos occurred through cooperation across international boundaries. The role of Yunnan and its capital city of Kunming in China-GMS trade cannot be understated. Yunnan’s GDP skyrocketed from $33 billion in 2000 to $160 billion in 2012, and the province aims to double that to $320 billion by 2017 through even stronger cross-border economic and trade ties. Kunming acts as the origin and core of economic activities that reach into the bordering countries of Laos, Myanmar, Vietnam, and beyond. Despite the overall growth of China-Southeast Asia trade, China exerts a disproportionately strong influence on the GMS through a Yunnan-based and regionally oriented policy that projects development consequences over the borders. On May 6, 2011, China’s State Council issued the important document entitled ‘Supporting the Accelerated Construction of Yunnan as the Important Outpost for the Southwest Region’, which tasked the capital city of Kunming to become the international hub for China’s southwestern region facing the GMS. Symbolically, Yunnan’s tallest building is rising in Kunming’s Panlong District, which will serve as the financial and commercial zone for the local presence and regional expansion of multinational companies. In implementing the ‘Kunming as an International Outpost’ strategy, Yunnan provincial and Kunming municipal governments have introduced a variety of policies and projects. 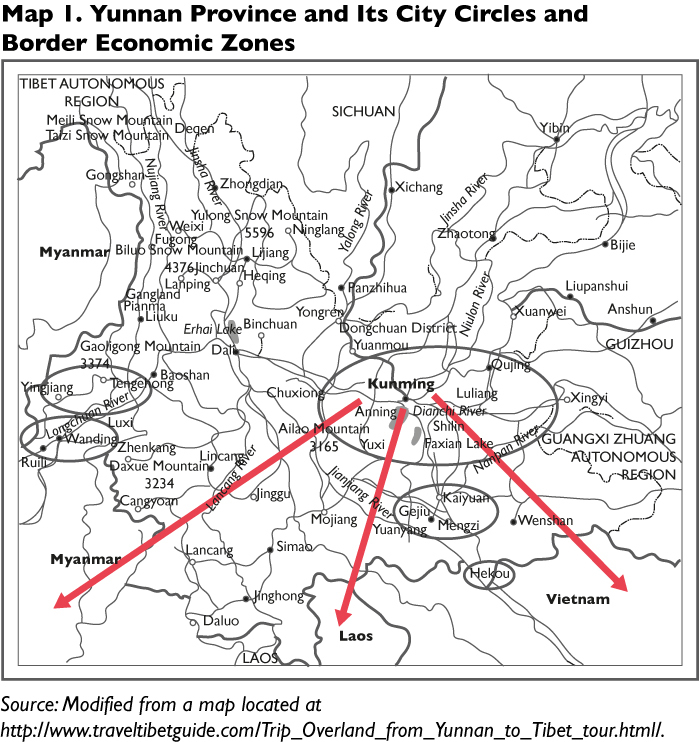 First, they are building a central Yunnan regional economic circle knitted together by the four cities of Kunming, Qujing, Yuxi, and Chuxiong with Kunming as the core (see Map 1).5 In May 2012, Yunnan approved the establishment of six border economic cooperation zones, including one around the city of Tengchong (see Map 1) (People’s Daily). This provincial initiative augmented the central government’s approval of opening three border economic cooperation zones in the cities of Ruili, Wanding (under the jurisdiction of Ruili but not controlled by it), and Hekou (Map 1) in 1992. Ruili and Hekou became the first and second largest border ports for Yunnan’s total foreign trade. Myanmar is Yunnan’s largest trading partner, and Ruili accounts for more than 30% of the trade with Myanmar and more than 60% of the province’s trade with Myanmar. To complement the spatial planning of new city-regions and lively border trade, Yunnan has created new institutional and cultural ties to the GMS countries. It has recently set up commercial representative offices in Singapore and Cambodia and is planning to expand the number of Confucius Institutes and Chinese language centers already operating in the GMS countries to increase China’s soft power. It has trained a growing number of specialists who can speak Thai, Burmese, and Vietnamese. The number of international students in Yunnan rose from 760 in 2001 to 10,000 in 2007 and to over 20,000 in 2011, with about 80% of them having come primarily from Southeast Asia (People’s Daily). The Myanmar border towns of Muse and Namhkam have done well by importing Chinese goods such as garments and consumer electronics, which occupy as much as 80-90% of the local markets in northern Myanmar. In Lashio, a remote but important market town 195 kilometres from Mandalay in northern Shan State, many trucks loaded with Chinese consumer goods rolled through the town and onto the booming city of Mandalay. The population of Lashio is about 50% Chinese, while Mandalay, the seat of Myanmar’s culture, is one-fifth Yunnanese Chinese. This Chinese ‘on the ground’ influence helps pave the way for China’s (and also Yunnan’s) new ambitious outlook for accessing the Indian Ocean over the Lashio–Mandalay land route. Back to Yunnan’s border city of Ruili, which has a highly mobile migrant population, the China-Myanmar nexus goes both ways, with Myanmar’s local presence becoming stronger. According to official statistics, an estimated 30,000 Myanmar people either come through the border daily or take up long-term presence in Ruili. This is roughly equivalent to 17% of the city’s total population of 180,627 in 2012, but this estimated figure only includes those who legally cross the porous and at times seemingly nonexistent border. On a recent day, we talked with two young Myanmese women from Muse working in two different bookstores in Ruili. Both of them are of Chinese descent, and both are happy to commute every day across one of the three checkpoints to work in China. At the same time, many from Myanmar have become more settled residents in Ruili and formed a distinctive local community, with its own grocery stores, coffee shops, hair salons, and long-distance telephone service. Most of the Myanmese men we spoke to are engaged in the jade trade. China even provides electricity and mobile phone service to Muse, allowing the Myanmese in Ruili to phone their family and relatives in Muse as local calls. To facilitate and scale up trade along and beyond China’s combined long border with Myanmar, Laos, and Vietnam, China has been extending its tentacles of transport infrastructure to the GMS in multiple directions (see Map 2). China has reached an agreement with Myanmar to construct a rail link between Myanmar’s Chinese border and its western coast. The railroad will run from the Shan State’s border town of Muse and span 800 kilometres across the country to Rakhine State’s port city of Kyaukphyu on the Bay of Bengal. The whole project is projected to take five years and is estimated to cost about $20 billion, and it will be borne by China based on BOT (build, operate, and transfer) for 50 years. Once completed, the railroad will allow electric trains to travel at speeds of up to 200 kilometres per hour and carry 4,000 tons of goods. Strategically, this railroad will carry China’s imports and exports to and from the port of Kyaukphyu on the Indian Ocean via Ruili and Kunming, obviating the need for ships to sail through the narrow Malacca Strait. Pushed by China, the Lao government has recently approved China’s offer to build a cross-border railroad to connect the capital Vientiane to Luang Namtha Province along the border with China, with a further extension to Kunming and a total length of 420 kilometres. The China-Vientiane railroad project, which is scheduled to be completed by 2018, will require the construction of 76 tunnels and 154 bridges. The projected cost will be over $7 billion. China has offered to extend a massive loan of $7.2 billion through its Import-Export Bank to Laos. Originally agreed upon as a China-Laos joint venture, the railroad ran into opposition for requiring Laos to hand over vast tracts of land to the Chinese contractor. 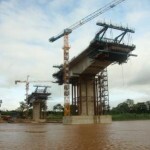 The project is now going to be wholly owned by the Lao government. Being landlocked, Laos is willing to make major concessions to its powerful neighbor in the north in an effort to turn itself into a country that is ‘land-linked’ with railroads. 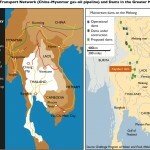 China is actually not alone in damming the Mekong. Laos stands out among the other GMS countries in maximising its abundant water resources from the Mekong to speed up development by selling hydropower to Thailand and China, which controls 32% of Laos’ hydropower projects. However, the huge environmental impact of such projects has worried Laos and pressured it to suspend its most controversial proposal to build the $3.8-billion Xayaburi Dam (Map 2). The GMS countries will continue to face the challenge in reconciling their competing development goals and interests bound together by a long international river. As China’s economic reach grows spatially through the GMS, it has also begun to stretch its sphere of political influence. After losing a dozen sailors on a freight boat plying the Mekong River, China pushed Thailand, Myanmar, and Laos to help hunt down a notorious drug lord who had been alleged to be the mastermind behind the Mekong massacre. 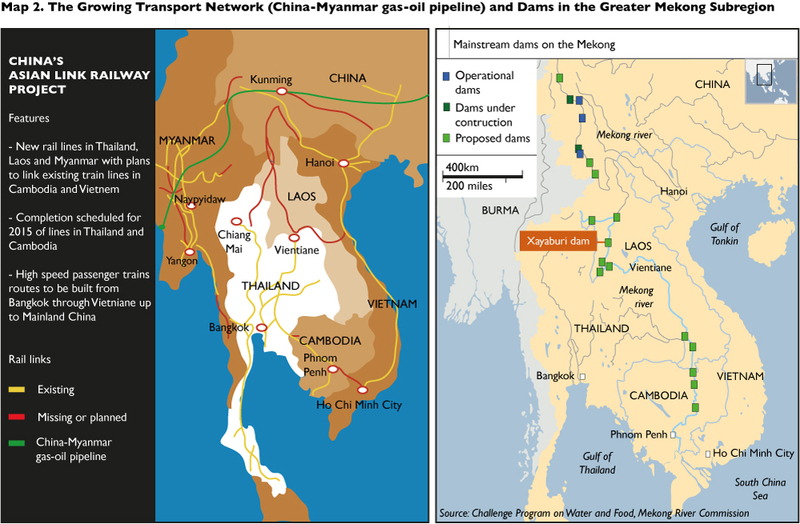 China worked closely with Myanmar and Lao police to capture Naw Kham, a Myanmar citizen, in northern Laos, and then extradited him to China where he was paraded live on television and then executed by lethal injection in March 2013.11 The China-Myanmar oil and gas pipeline, which starts at Kyaukpyu port on the west coast of Myanmar and enters China at the city of Ruili, has run into some resistance by local farmers in northern Myanmar living near its route, and the concerns of an increasingly skeptical Myanmese public wary of China’s growing dominance were further heightened at the end of July when the natural gas pipeline started to deliver gas to China, but it is expected to be complete and fully operational later this year. This project is designed to transport 22 million tons of crude oil and 12 billion cubic meters of gas per year from Myanmar’s west coast to Kunming for processing by a new large refinery. This in turn will provide much needed energy for China’s southwestern development that will spread even more across the borders. Some recent developments south of Yunnan may counter or offset China’s influence as Southeast Asia itself also continues to integrate. The ADB has provided a total of $220 million to strengthen small cities in Laos, Cambodia, and Vietnam along the East-West Economic Corridor, allowing female street vendors in three small cities to have access to a micro-finance project worth $2.5 million in non-refundable aid from the Japan Fund for Poverty Reduction. Higher labor and land costs in China than in Laos, Cambodia, Myanmar, and even Vietnam have already driven some of the most labor-intensive industries (i.e. shoes and garments) to Southeast Asia. In 2012, Cambodia received more foreign investment per person than China for the first time since the 1970s. Laos has built the Savan-Seno Special Economic Zone in Savannakhet City to attract more labor-intensive manufacturing by connecting Thailand to China and Thailand to Vietnam, trying to catch up to and learn from China’s experience and trajectory of development. The GMS countries will continue to perform well, with or without China’s investment, due to extensive economic and spatial ties as well as cultural ties with its northern neighbor. It is up to all six member countries of the GMS and not just China to determine how both regions can compete and yet cooperate to achieve greater sustainable development. If a healthy relationship between China and the GMS can be not just maintained, but deepened, the economic and political landscape of the Mekong Region will be forever reshaped. Xiangming Chen has since 2007 been the founding Dean and Director of the Center for Urban and Global Studies and Paul Raether Distinguished Professor of Global Urban Studies and Sociology at Trinity College in Hartford, Connecticut. He is also a Distinguished Guest Professor in the School of Social Development and Public Policy at Fudan University in Shanghai, China. He has published extensively on urbanisation in and globalisation of China. His books include As Borders Bend: Transnational Spaces on the Pacific Rim (Rowman & Littlefield, 2005), Shanghai Rising: State Power and Local Transformations in a Global Megacity (edited, University of Minnesota Press, 2009), and Rethinking Global Urbanism: Comparative Insights from Secondary Cities (co-edited with Ahmed Kanna, Routledge, 2012). We acknowledge the Paul E. Raether Distinguished Professorship Fund at Trinity College for supporting our field research trip to the border areas of Yunnan Province, China, Myanmar, and Laos, in June 2013. For parts of this article, we have drawn from a paper that Xiangming Chen wrote recently for the Asian Development Bank. Chen, Xiangming and Fakhmiddin Fazilov ‘China and Central Asia; A Significant New Energy Nexus’. The European Financial Review (April/May), 2013, pp. 38-43; Kayla Chen and Xiangming Chen, ‘China and Latin America: Connected and Competing’. The European Financial Review (February/March), 2013, pp. 56-58. ‘Internationalizing education in Yunnan’. The People’s Daily, January 22, 2013, p. 2. ‘The Central Yunnan Urban Economic Circle takes off’. The People’s Daily, October 22, 2012, p. 2. This article was first published here on the website of the European Financial Review.